DAVIS, Calif.—UC Davis quarterback Jake Maier threw for 310 yards while wide receiver Keelan Doss hauled in nine catches for 137 yards, helping the sixth playoff seeded UC Davis t to a 23-16 win over Northern Iowa in a Division I FCS second-round contest at Aggie Stadium with 8,306 in attendance. It was the first Division I playoff win for the Aggies. Kicker Max O’Rourke kicked three field goals while tight end Wesley Preece and redshirt freshman running back Ulonzo Gilliam each added touchdowns for UC Davis (10-2) offensively. UC Davis faced a 6-3 deficit late in the first half, with both teams only managing to put field goals on the scoreboard: one by O’Rourke, two by Panther senior Austin Errthum. The scoring started with Preece’s four-yard touchdown from Maier in the final minute of the opening quarter. Two O’Rourke field goals in the second quarter provided the halftime score of 16-6. A wild 16 minutes to start the second half ended in a 3-point gain for the Panthers. Meier threw two interceptions and Eli Dunne threw one of his own in that 16-minute span. Gilliam’s two-yard rush midway through the third provided UC Davis with a 23-6 margin. Northern Iowa (7-6) answered with a one-yard Trevor Allen scoring run with six minutes left in the third, then Errthum’s third field goal from 45 yards out brought UNI to within 23-16 in what proved to be the final score of the game. UNI and UC Davis exchanged field-goal misses in the final 14 minutes. Errthum sent a 42-yard attempt wide right that would have drawn the Panthers within four and O’Rouke’s miss for the Aggies from 38 with five minutes left provided one last chance to draw even. Beginning at their own 21, the Panthers went 54 yards in 10 plays, getting to the Aggies 36. Facing fourth-and-10 with no timeouts, Dunne’s attempt for Briley Moore was broken up, turning the ball over on downs. Since UNI had no timeouts remaining, UC Davis was able to just kneel the ball on three straight plays to expire the clock. Doss’ 137-yard performance extends his school record of 100-yard games to 18. 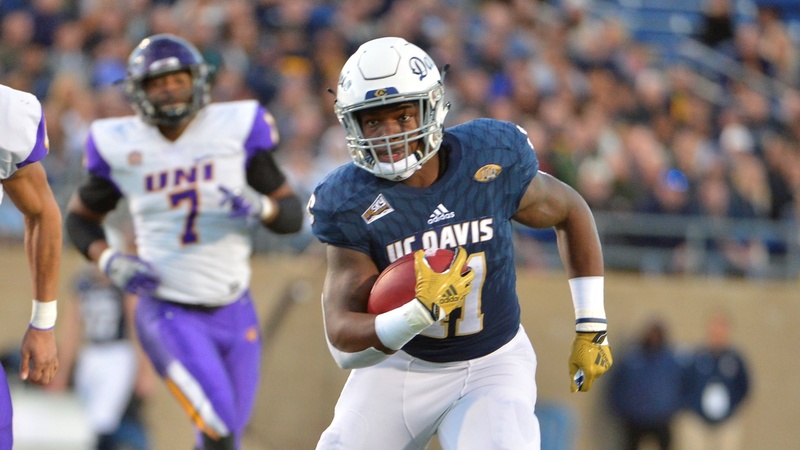 Tehran Thomas led UC Davis on the ground with 87 yards on 13 carries. For UNI, senior quarterback Eli Dunne threw for 273 yards while Allen rushed for 62 net yards. The Aggies move on to have a rematch agains Big Sky Conference rival and third playoff seeded Eastern Washington in the quarterfinal round next week. The Aggies lost 59-20 at EWU on Nov. 10.